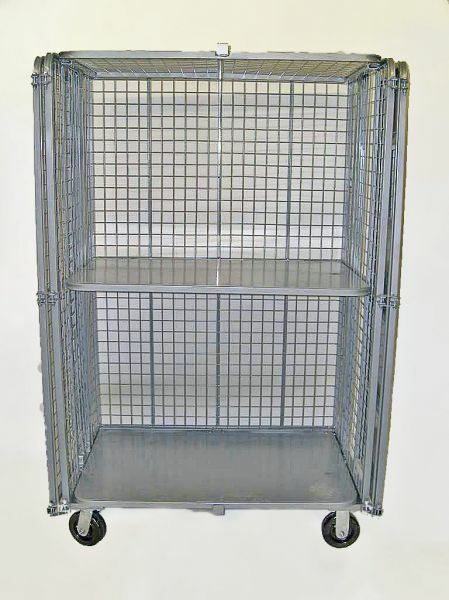 This wire mesh cart protects items stored or transported in this mobile security cage. In over-the-road applications this cart is often used for securing unattended deliveries. Cartloads speed loading and unloading times and reduce loss. The locking door handle, which operates locking rods on both the top closure and bottom shelf, will accept either padlock or truck door seal. The right hand door is intentionally solid to prevent tampering. With 2 swivel and 2 rigid casters this security cart not only protects your products, but looks good doing it. It also features a bill pocket with top flap and plexiglass front. Our cage cart improves baggage handling efficiency, accuracy and passenger satisfaction. Loads are easily assembled dockside and rolled aboard cruise ships, into elevators and down narrow corridors for rapid accuate delivery.